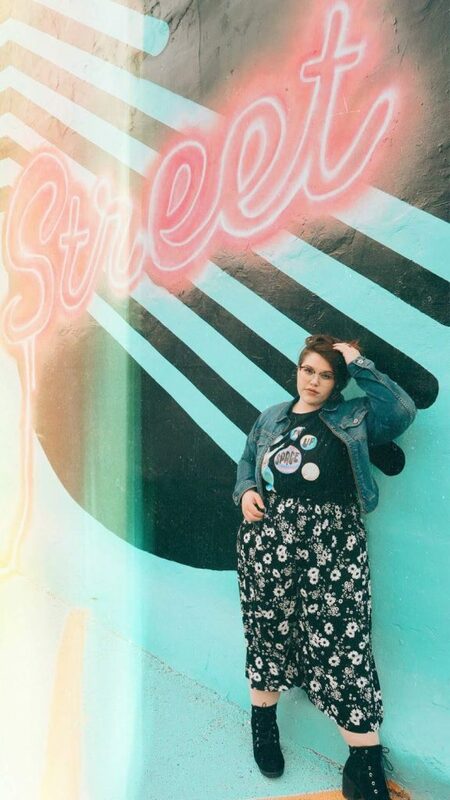 Today’s Fashion Blogger Spotlight is a queer petite plus size blogger who loves sharing everything from her personal style to her favorite treats to her journey to self love. Meet Maggie of Maggie McGill and get inspired! Hope you enjoyed meeting up with Loiselle of Curvy Statements last week! We’re back this week with another petite plus blogger, Maggie of Maggie McGill! 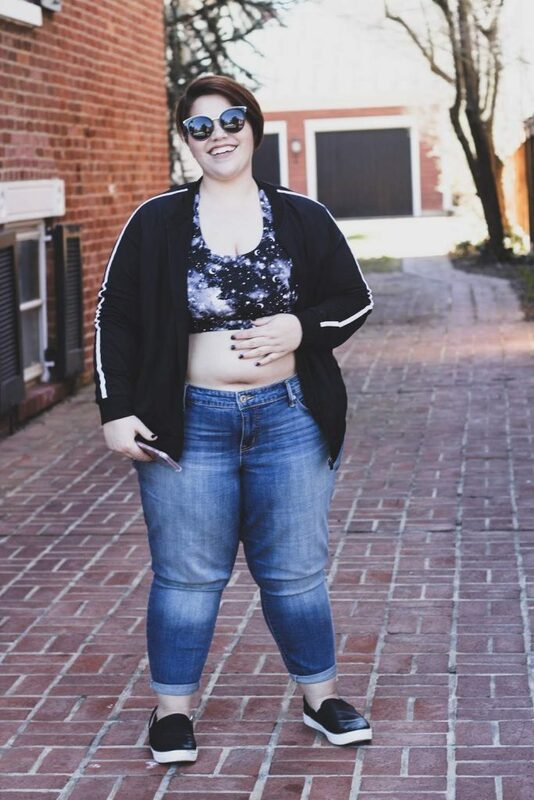 Maggie shares her struggles with fit as a petite plus size woman, including as it relates to her desires to maintain a more androgynous look. Through her blog, Maggie shares not just her personal style but so much more. 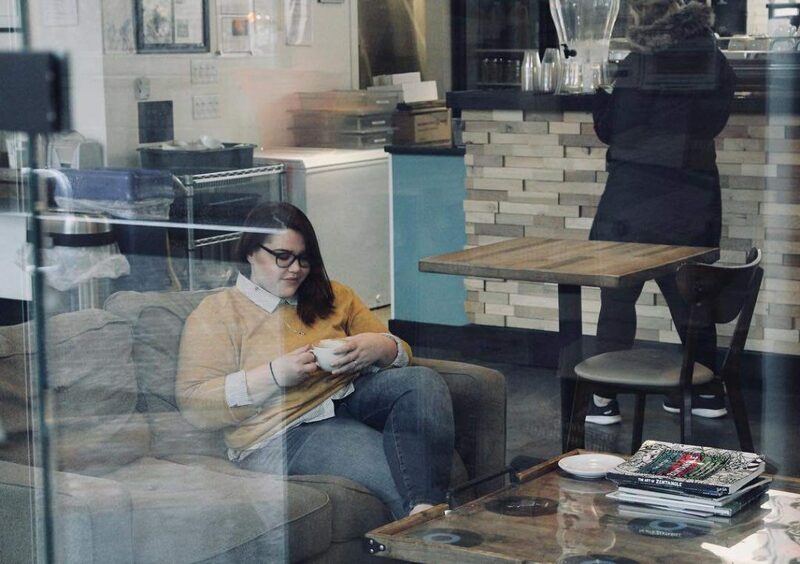 From movie analyses to her body journey to her favorite treats, Maggie loves telling stories and sharing body positivity making her a plus size blogger YOU NEED TO KNOW!!! 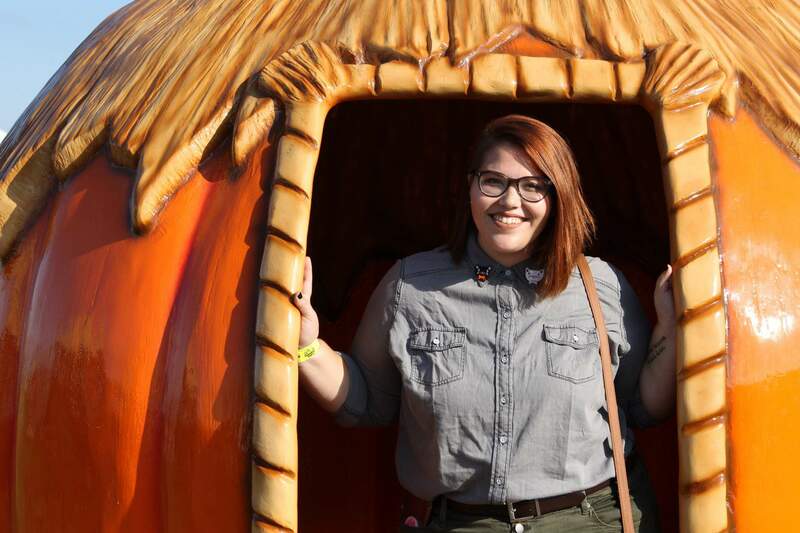 Meet Plus Size Blogger, Maggie McGill! Depends on what you consider blogging. I’ve been blogging my life on WordPress since the end of 2015. I’ve been blogging on my Tumblr page fatqueerstyle since 2011. I went to Catholic school from K-12 and wore a uniform almost every day of my life. It was only in college that I really began experimenting with fashion and, simultaneously, body positivity. I started posting outfit photos on my Tumblr blog as a way to love and accept my body and inspire others to do the same. Realizing that I could turn my passion into a career made me take blogging more seriously. I blog as a hobby with the intention of blogging full-time in the future. I have a background in communications and visual media production, so I basically have a degree in blogging and creating content for my YouTube channel. Right now I’m using my skills to work at a local non-profit but I feel as I gain more momentum, I’ll have the opportunity to make content creating my full-time gig. As a queer person, choosing a favorite asset is difficult. Truthfully, I spend a lot of time and energy trying to conceal parts of my body in an effort to look androgynous. So I guess my favorite asset is my face because I can change my face so easily with makeup, glasses, and piercings to fit my mood. Being plus-size and petite is frustrating and involves a ton of altering, either from a tailor or from my sewing kit. Most pants are too long, even cropped styles, and because my calves are big, I can’t roll them up much. Guessing how clothes will fit on my body is also difficult because the models most companies use are tall and narrow. I am short and extremely curvy and things never look the same on my body as they do online. I also feel my height will hurt my chances of modeling professionally if I decide to pursue that. My favorite thing about being petite and plus-size is that it makes me feel cute. I also don’t have to worry about having enough leg room in any situation. My favorite thing about being a plus fashion blogger is the community. Being in a marginalized group and having a tight-knit circle of babes supporting you is incredibly valuable. We all want each other to succeed because it means more visibility for fat folks at home who need to see their own bodies represented in media. I am just dipping my toe in the high fashion world right now, but as for brands that I know and love to wear, ASOS is brilliant. 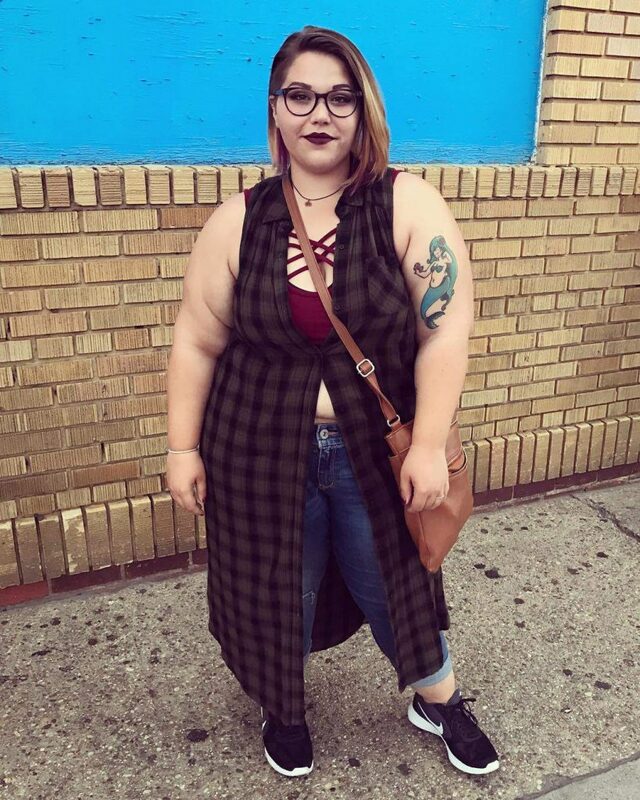 I also enjoy Torrid, Target, Walmart, and Yours Clothing for wide width shoes. I’m a babe on a budget, and financial accessibility is important to me and the people who follow me, so I try to stay true to that. Cool, comfortable, casual, and a bit offbeat. I love graphic t-shirts, sneakers, and jackets for every day but when my favorite time of year (Autumn) comes around, I get a little extra. I love gaining inspiration from my fellow plus size bloggers. 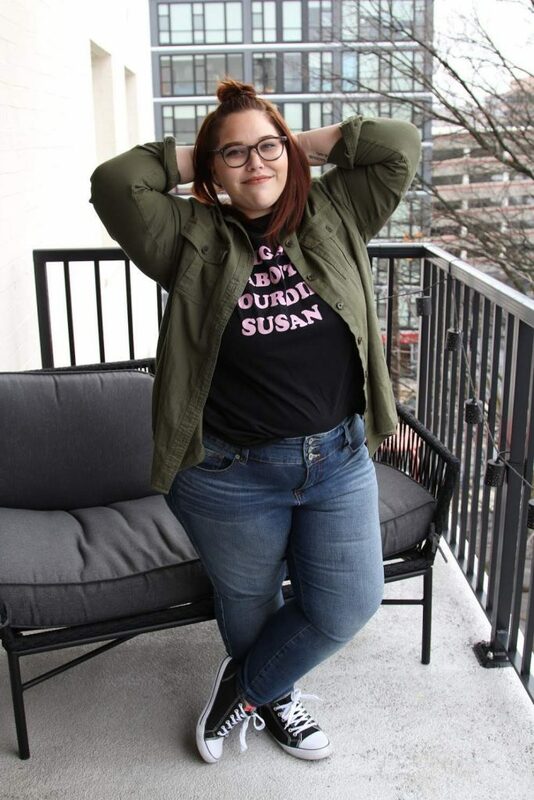 Alysse from Ready to Stare is more femme than I am, but we are the same height and body shape so I can see how clothing that’s out of my comfort zone would look on my body. Margot Meanie is my goth inspo, Corissa from Fat Girl Flow is my boho inspo, Loey Lane is my beauty blogger inspo. I also watch Tanya Burr very closely, probably one of the few straight-size people I follow on Instagram, because she’s always on top of the latest trends and has a real sophistication about her. J from Comfy Fat is doing the lord’s work and blogging about really important topics too. 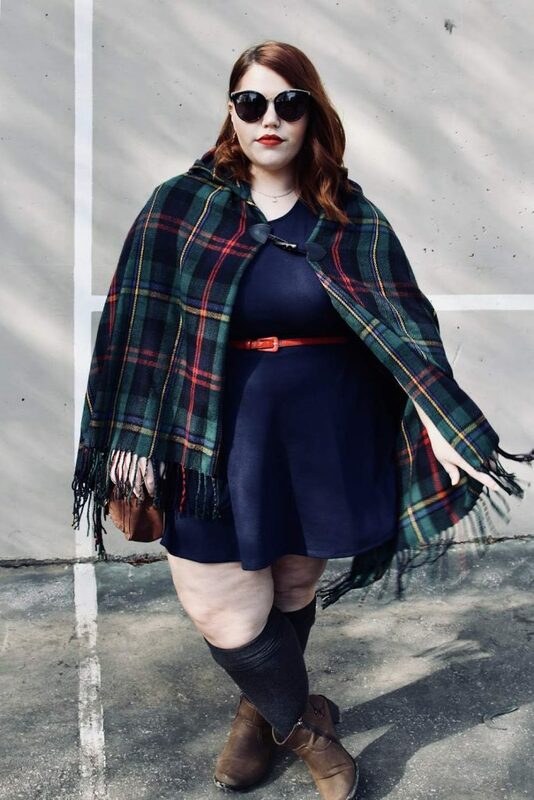 Plus size fashion is making leaps and bounds every year, but there are still areas that haven’t budged an inch, like retailers making clothing for people over a size 3X. One annoying myth is that plus size people don’t want to spend money or invest in their clothing. Another is that plus size people want to cover most of their body all of the time. Other than blogging, I upload a video on my YouTube channel at least once a week and am very active on Instagram and Twitter. To me, Curvy.Confident.Chic means taking the essence of who you are and expressing that through external presentation and actions. Having certainty in yourself and your style speaks volumes more than any particular piece of clothing, and strutting down the street with that attitude will make anything look high fashion. Check out Maggie’s blog at MagsMcGill.com!! !